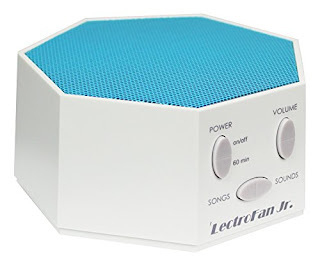 I love that this white noise machine can plug into a laptop or any USB outlet! I often use white noise in the car when I'm trying to get my toddler to sleep while traveling and I can just plug the LectroFan into the cellphone charger! Very Nice! I like the nursery rhyme songs a lot. Like other reviewers I wish that the sound wasn't so sharp and 8 bit style, but I still like turning it on in my kids rooms while they play for fun ambient music. 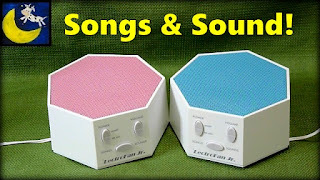 I really love the song selections including some of my favorites, "Buffalo Gals, Billy Boy and Old Folks, Young Folks." If you've never heard the words to "Old Folks, Young Folks Everybody Come" you will have to click here: http://www.kididdles.com/lyrics/a038.html. It's a LOL one of a kind song. The kind of song everyone has their own version to. But let's get back to the LectroFan. This soother has many fan and white noise options so you can find exactly what your looking for. I wish it had a rain sound or waterfall sound but other then that it has just about everything! Including different pitches from low to high of white noise. I love how loud this soother can get and how low it can get, You will be able to drown out lots of noise with this one. The timer button can get set for 60 minutes with one click. Then with each subsequent click you will add 60 minutes. So that is super nice. If you don't click the timer at all then it will just keep playing! This soother white noise machine cost 50 dollars on Amazon. This seems a little pricey to me, but when sleep is concerned I suppose price doesn't matter nearly as much. 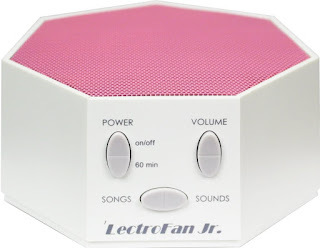 I hope this review helps you out and I want to thank LectroFan for giving me this product so I could test it out! Thanks!